Single Origin Blends Decaf Where To Buy? Full-bodied with a distinct richness, sweet with earthy overtones, and well liked by many. Aromatic Medium-bodied coffee, alive, with a hit of chocolate. Full-bodied, semi-sweet and well balanced. Known to be one of the worldâ€™s finest coffees. Medium-bodied and bold with hints of citrus. Evenly balanced coffee, medium-bodied with lively acidity. Great after dinner coffee. Full Bodied and bold, with a hint of bitter sweet dark chocolate. Full-bodied, aromatic and complex, grown from seeds fo the Jamacian Blue Mountain region. Great Coffee! 100% pure top-grade Kona. Chosen from one of Hawaiiâ€™s top estates, Medium to full-bodied, with sweet overtones. Jamaican Blue Mountain coffee has been labeled as the best coffee money can buy. Medium-bodied and full of flavor. 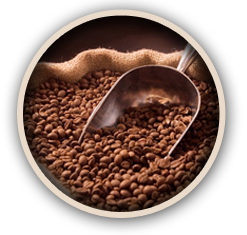 For the past 50 years, family-owned Fratelli Coffee has been roasting, blending and providing our customers with the world's finest coffees. Our story began in Italy, where our family learned to select the beans and blends that would make the best tasting coffees.